That makes sense, right? Like a master illusionist, Governor Cuomo arranges the facts and the audience sees just what he wants them to see. I wrote about this issue last week, pared down to a few essential points. Today, the rest of the story. Look at what the Governor would have us believe: that teachers are responsible for student proficiency. We know it isn’t true – when my daughter brings home a good report card, she gets the credit (and the 5-spot). When she makes honor roll, I don’t congratulate her teachers for their work. I know the bulk of my daughter’s learning is HER RESPONSIBILITY. Her teachers outline what needs to be learned, point the way, correct her when she veers off course. They are guides, not knowledge-delivery systems. My daughter could have the best teachers and still wouldn’t become proficient if she didn’t attend class, remain attentive, do her homework, and if I didn’t support her with encouragement, food, shelter, security, etc. The teacher is a relatively small, although crucial, part of the formula. Medical professionals know that good health comes from proper nutrition, regular exercise, enough sleep – doctors are not expected to ensure their patients’ well being in the absence of those prerequisites. Sociologists know that low crime tracks with socio-economic factors, and is affected by positive community involvement – police are not expected to guarantee zero crime on their own. (OK, yes, sometimes they are expected to work that miracle – usually by politicians.) If my home burns down, I can’t blame the fire department – I should have taken care of the faulty wiring and changed batteries in my smoke detectors. And is it the director’s fault if the actors don’t know their lines? School boards, superintendents, principals and teacher advocacy groups don’t want bad teachers any more than the Governor does. Bad teachers are already being removed from the classroom (which might be why those who remain are rated effective – the current system is working.) 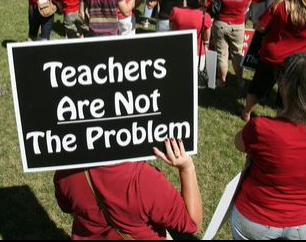 Do we really want the state to evaluate our teachers? Using tests that most education professionals say aren’t good evaluation tools to begin with? Who will even want to enter the teaching profession under those conditions? Activists would have us opt out of state tests. They say it will send a message, and of course it will. But opting out is not the best solution. What message do kids get from that? What about the kids who end up taking the tests (including my daughter)? If there’s going to be civil disobedience, I’d rather have my entire school district opt out – don’t offer the tests at all. Now, that might cause short-term difficulty, if it costs us state funding. We’d have to be prepared to make up the shortfall. But kids would benefit immediately – no more practice drills, no more “teaching to the test.” And once other districts follow suit, systematic change would follow. Maybe you’re asking, “Isn’t there an education crisis to deal with?” Maybe. Of course, we’re calling it a “crisis” based on results from tests that experts say can’t be trusted. So there’s that. But let’s stipulate that improvement is possible. Instead of putting the load on teachers, why not figure out how to improve our learners? Spread the responsibility around. I didn’t pay attention in school. Why? Because I couldn’t see how it would benefit me. Sure, there was the abstract “good grades will get you into a good college,” but that wasn’t motivating. A good college costs a lot of money and takes forever to pay for. And it doesn’t guarantee a job. And how many parents short-circuit the educational process with comments like, “I haven’t used algebra once since I got out of school.” Which sends the message, “You’re being forced to learn a lot of dumb stuff that isn’t helpful or relevant.” (And because it bugs me, I want to address the algebra idiocy: mathematics and other components of general education provide building blocks, i.e. options, to pursue advanced learning paths later. Even if specialized paths aren’t chosen, the discipline of learning basic concepts builds critical thinking skills, which are infinitely transferable.) And look at the furor over Common Core curricula. Parents who complain that Common Core should be ditched because they can’t help their kids with homework send the message that complex material should be dumbed down. I want our kids wrestling with advanced concepts – if I don’t understand the material, that’s my problem, not theirs. So how do we motivate students? Most can’t see fifteen or twenty years down the road – I couldn’t. We need to set short-term goals that are part of a clear roadmap of how education contributes to a better life. Not just “when you’re grown,” but now. And two weeks from now. And three months from now. Career days are good, but careers are impossibly distant. My daughter wants to be a professional stage manager, but I struggle to make her understand how learning global history and latin will impact that goal. And the news is filled with stories about downsizing and layoffs. Education needs to be more than just, “So you can get a job and be part of the economy.” It’s about participation in the community. It’s about appreciating art, and beauty. Having a toolset to make better choices. Real motivation is whatever helps students understand that education matters even now. Don’t trust Governor Cuomo, political magician. He has an agenda, and he’s using misdirection to fool you. If you think public school teachers aren’t effective, first ask yourself, “Why not?” Use your math skills, and set up the problem. Does the Governor’s assessment and proposed solution really make sense? Think about the teachers you’ve had. Are you the sum total of what they’ve crammed into your head? I suspect you can’t think of many ineffective teachers. And if there are a few (what profession doesn’t have duds), do we really want to subject our kids and the entire public education system to ever-increasing testing, just to weed out a few? Take a step back, and let’s figure out a better way.